Believers, in Christ we have been filled with all these wonderful qualities. 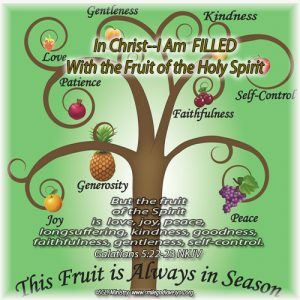 As the Holy Spirit abides in us, and we walk with Him daily, these fruits will come forth in our lives. God wants us to be fruitful in good works, that is why He has provided us with all these fruits, and as we walk in the Spirit and do God’s work we, and others, will see these fruits produced in us daily. But, our old nature, the flesh, does not want us to be fruitful. It does not want us to walk in the Spirit and produce these fruits in our life daily, therefore every day we will have a battle with the flesh and we will have to make a choice to walk in the Spirit and not give in to the flesh. So daily let’s determine we are going to be fruitful and let all these wonderful fruits we have been filled with come forth in our lives. Let’s determine each day that we are going to walk in the Spirit, and as we do, we and others will begin to see these fruits manifesting in our lives.